The following analysis examines one aspect of this goal: the availability of public infrastructure through the lens of land demand and land supply. The study area is the Downtown Urban Center between the waterfront and Interstate 5 and between Denny Way and Dearborn Street. This is approximately 1.3 square miles (830 acres). The study area includes most of Chinatown-International District and Pioneer Square and fully encloses the Commercial Core, Belltown, and Denny Triangle. Arguments can be made for different boundaries in all directions, but this is a reasonable start provided the limited capacity of a volunteer writer. I may return with a broader scope, and requests for further information can be shared on the contact page. 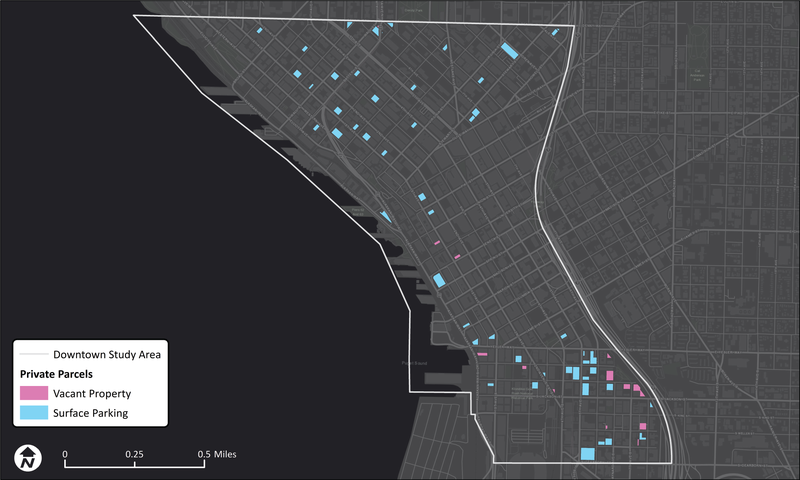 Downtown is not as diverse as many Seattle neighborhoods, but the data shows it is not homogeneous either. Within the study area residents are 30-50 percent people of color. The range of median annual household income is extreme, from $23,000 in historic Pioneer Square, $35,000 to $55,000 on the east and west edges, and up to $86,000 in leafy parts of Belltown. 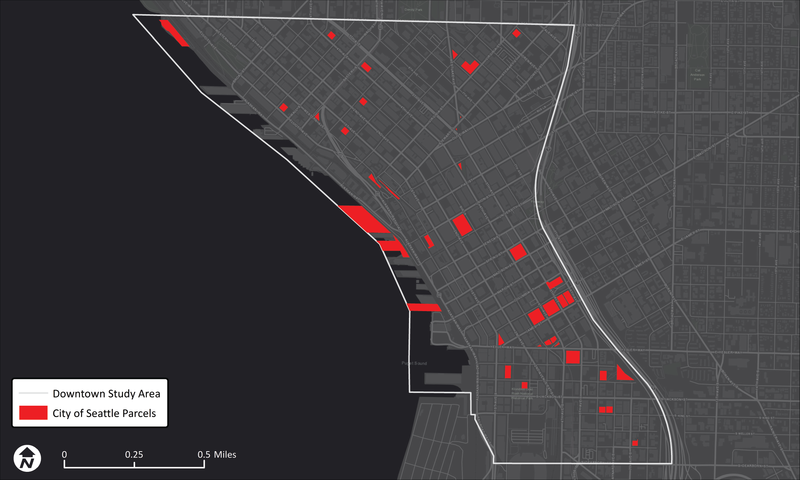 The area is also home to a dense concentration of City-funded income-restricted housing. Between two and six percent of residents are high school age or less. While Downtown land use is primarily commercial the residential density is comparable to the surrounding neighborhoods, ranging from 15 to 56 people per acre. The 2016 Comprehensive Plan expects the 24,000 households in the Urban Center to increase to 36,000 by the year 2035. The same area has over 165,000 jobs, a number projected to grow to 200,000 by 2035. Seattle and King County also host almost 40 million visitors per year, many of whom visit Downtown. It is clear that public infrastructure here serves not only many residents of varying socioeconomic backgrounds but also hundreds of thousands of people who work and visit every day. The first step is determining the scale of the infrastructure needs. The focus here is on capital facilities which are intricately linked to the availability of land: affordable housing, public schools, community facilities, and parks. A future analysis may consider other infrastructure like public safety and utilities. It is essential that cooks, custodians, security guards, cashiers, and other Downtown workers have opportunities to leave near where they work. Short commutes by foot, bike, and transit in compact neighborhoods help people spend more time with their families and easily access daily needs. Public housing (defined here as housing either owned or subsidized by the city government) is a key component of building a more affordable Downtown. In First Hill, nonprofits Plymouth Housing and Bellwether Housing are teaming up to build a 13-story tower on land donated by Sound Transit. This will be the first new high-rise affordable housing tower in over 50 years. Given the scale and urgency of the affordable housing crisis it appears nonprofit builders and public agencies are willing to build tall again. Seattle and King County have over 11,000 homeless people in need of safe and supportive housing, and many of the SHA properties have wait times of three years or more. There is clearly an extreme need for more affordable places to live in the urban core near jobs, social and commercial services, and transit connections. Supply of public land is a not a silver bullet that will fully address the affordable housing shortage, but it would help. Calculation: Over the next decade the Seattle Office of Planning and Community Development (OPCD) estimates Downtown developers will build 60 privately-managed affordable homes and fund over 1,300 more through the Mandatory Housing Affordability program. Those funds can be utilized citywide but are ideally used to locate the homes in or near Downtown (though higher land values are a factor). A starting point is locating at least 1,000 of affordable homes on public land in Downtown. The six SHA sites total 939 homes on on approximately 2.9 acres, an average of 323 units/acre. Optimistically, future residential towers will take greater advantage of zoning and be one-third denser, so 1,000 public homes requires a minimum of 2.3 acres. To support the education of the next generation, especially for kids who live in public housing, a major issue is the lack of public schools in Downtown. The Downtown Seattle Association (DSA) has long recognized this with its “family-friendly” task force, whose focus is siting an elementary school. The DSA points out, “children are the fastest-growing demographic in our center city. More than 1,900 children live west of I-5 in downtown.” While the DSA defines Downtown much more broadly to include parts of Capitol Hill and First Hill, the point stands. 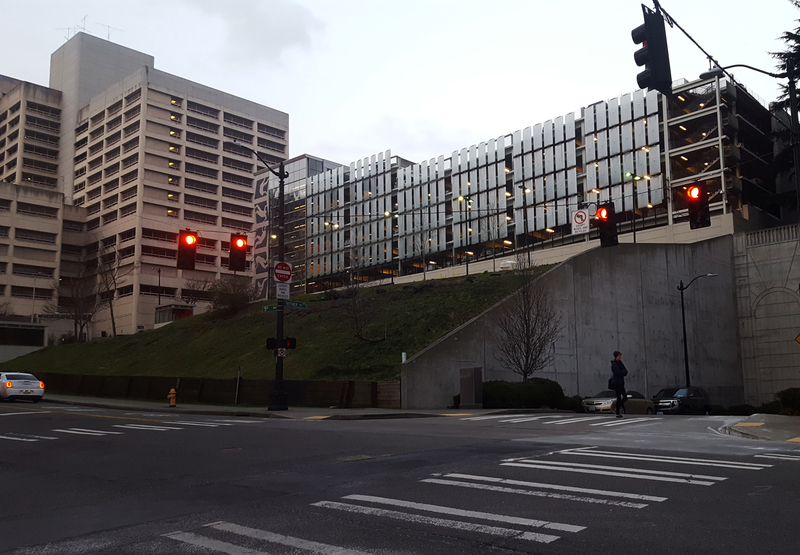 Seattle Public Schools (SPS) also recognizes this necessity and in 2015 tried purchasing the old Federal Reserve Building, a centrally located site with multi-modal access. However, SPS revoked their bid due when they learned about the costs of renovation. The need for a neighborhood middle school is similarly important, with the closest options uphill and two miles away. In 2017 the City and Seattle Public Schools agreed to locate a new high school at Seattle Center, though the exact site, construction schedule, and cost are not yet known. Given the complexities of that campus it may be too early to stop looking for an alternative Downtown site. Calculation: The 0.6 acre Federal Reserve site was large enough to host a 600-student elementary school in a four-story building, but the key factor for a vertical school is the size of the floor plate and outdoor activity space. The footprint of that building is 0.3 acres, large enough for Seattle Public Schools to consider it. Assuming a similar footprint is also adequate for a middle school, at least 0.6 acres are needed for Downtown public schools. Downtown is one of those Urban Centers but after years of residential growth the neighborhood still does not have a permanent community center to call its own; a small center does exist in Belltown, but the facility is leased and may not last amid development pressures. There are also edge centers in Yesler Terrace and Chinatown-International District, but given the pace and location of recent residential construction they may need reinforcement with additional capacity. Beyond Downtown, the neighboring Urban Centers of First Hill, Capitol Hill, and South Lake Union are in a similar situation. Downtown’s smaller neighborhoods are also due for their own branch libraries. After opening in 2004 the flagship Central Library has been wildly popular. In a 2008 interview with Seattle PI architect Joshua Prince-Ramus noted, “What makes me happiest is the volume of people who are in it. We programmed for 3,000 people to use it daily and its usage is double or triple that”. The Central Library was the last to open in the system, and in the meantime some 100,000 more people have moved to Seattle. More neighborhood branches, even small ones, would make the library’s collection and many services even more accessible. 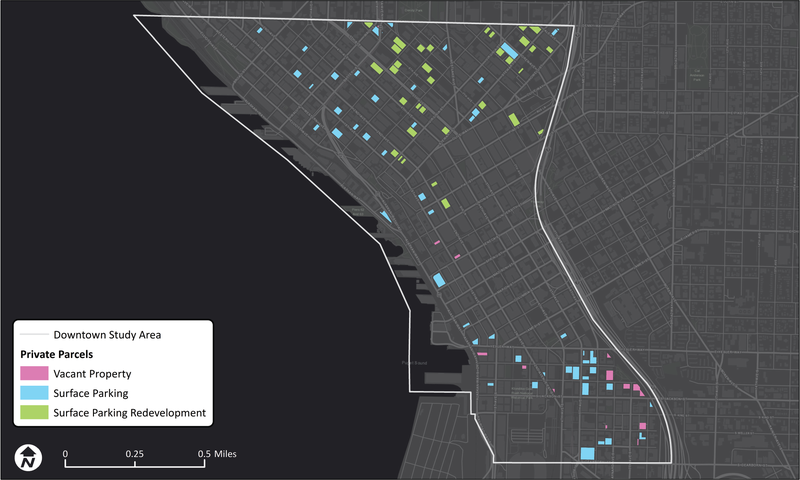 The system map shows potential expansion opportunities in Chinatown-International District and Belltown. 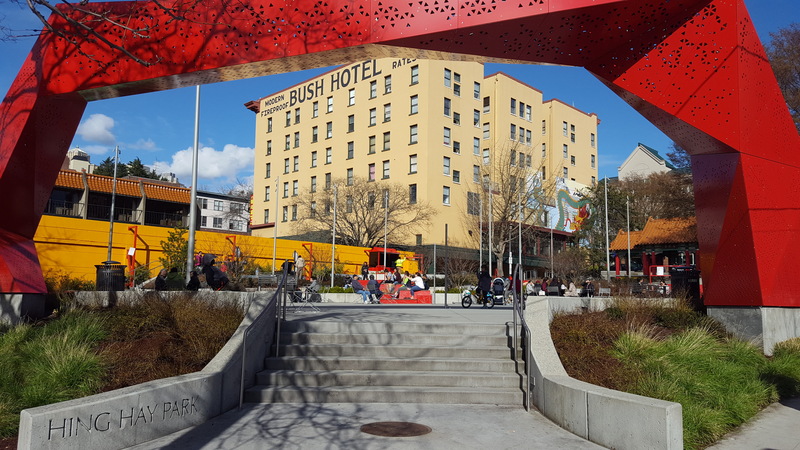 Community center calculations: The Chinatown-International District and Yesler Terrace facilities are each about 30,000 square feet and the Belltown center is 6,500 square feet. A reasonable goal is doubling this capacity and assuming at least two-floor configurations, requiring 0.8 acres for Downtown community centers. Library calculations: The two-story Capitol Hill library branch has a compact 0.1 acre footprint. Assuming the need for two more branches like this in Downtown, 0.2 acres are needed for libraries. Public parks and open spaces are critical for supporting people living and working in dense urban environments. They help urbanites relax, exercise, socialize, and host public events. Great parks provide momentary respite from busy streets, chances to people watch, views to landmarks and the open sky, soothing trees and water, and places to sit, eat, and play. Downtown already has some great spaces. Small as it is, Westlake Park is a defacto gathering place for parades, protests, and holiday events. It and Occidental Park have successfully been activated with daily programming in a partnership with the Metropolitan Improvement District. Victor Steinbrueck Park offers solitude amid the hubbub of Pike Place Market and will soon have a major overhaul. 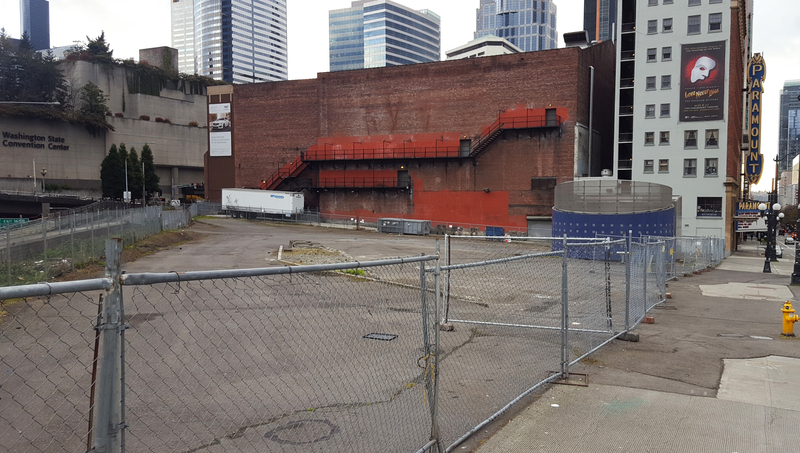 Freeway Park, Downtown’s largest public space, is largely hidden but is planned for rehabilitation to facilitate bigger and better events. A well-designed expansion of Hing Hay Park opened in 2017. Other small parks and private plazas dot the Downtown area. As more people pack into Downtown Seattle, though, the lack of larger open spaces and all-ages amenities becomes ever more noticeable. None of the above major parks have features like playfields, dog runs, skateparks, or sportcourts. In a 2014 citywide survey residents’ top priorities were large parks, walking/running trails, playgrounds, teen and special needs programming, and athletic fields; these elements are not readily available within Downtown either. In contrast, places like Portland, Denver, Chicago, Phoenix, and and Minneapolis provide generous open spaces within their downtowns and people enjoy them for activities from jogging to music festivals. 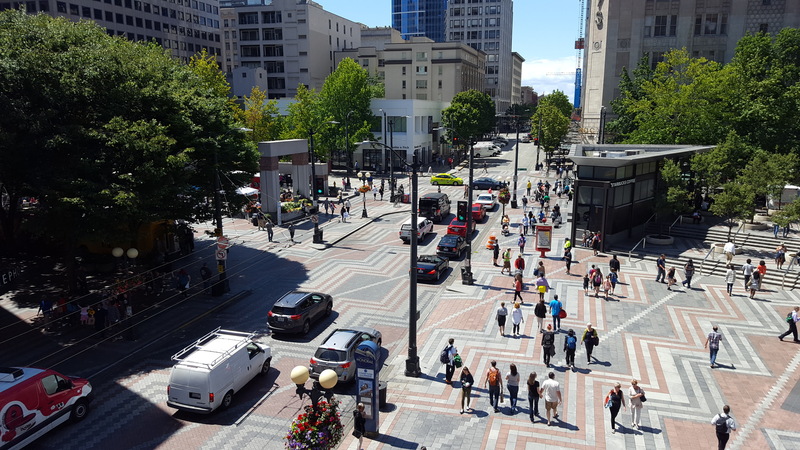 How much and what kind of park space a city needs is debatable and can be measured in many ways, but Seattle does offer a starting point: for decades the Comprehensive Plan established quantitative goals for urban centers and urban villages. In the 2005 version the urban centers goal was one acre of “usable open space” per 1,000 households and one acre per 10,000 jobs. “Usable” is defined as at least 10,000 square feet in area and in public ownership. The 2016 Comprehensive Plan update dropped these quantitative goals at the recommendation of the Washington State Office for Recreation and Conservation, which suggests adopting a system-based approach that considers walkable access, number of visitors, programs, and budget allocations. A simple ratio method also becomes self-defeating as density increases within a constrained area. However, it is still helpful to understand historical goals for Downtown. Using Comprehensive Plan data, an analysis shows today there is a parks deficit of over 14 acres. Accounting for growth and even 13 acres of planned open space with Waterfront Seattle, by 2035 the deficit will grow to 17 acres. Given the intensity of existing development this gap may not be closed without aggressive or creative efforts. The proliferation of privately owned public spaces (POPS) might help in limited ways. These are typically small plazas built in exchange for taller skyscrapers. A few Downtown POPS are successful and invite public use, but for most the name belies their design. Many are hidden, poorly designed, inactive, or feel unwelcoming due to security presence. They cannot be counted towards the public parks goal. Another approach is converting streets into parks, an increasingly popular tactic where options are limited. Famous examples include Times Square and the banks of the Seine. Locally the Pavement to Parks program has adapted streets in places like Rainier Vista, First Hill, and Capitol Hill, providing space for public events and passive use. On the other hand, pavement parks have minimal potential due to their paved surfaces and constrained size. There is not an obvious Downtown street to close completely to traffic and replace with family-friendly features like playgrounds, sportcourts, dog runs, or splashpads. Bell Street Park, a refreshing pedestrian experience, does not qualify as a usable park because it operates as a vehicular street at most times. Calculation: After Waterfront Seattle is completed the remaining Downtown parks deficit is estimated to be 17 acres. Considering the enormity of this amount, a reasonable goal is half that: 8.5 acres. Adding up the demand categories, the estimated demand for Downtown public land is 12.4 acres. 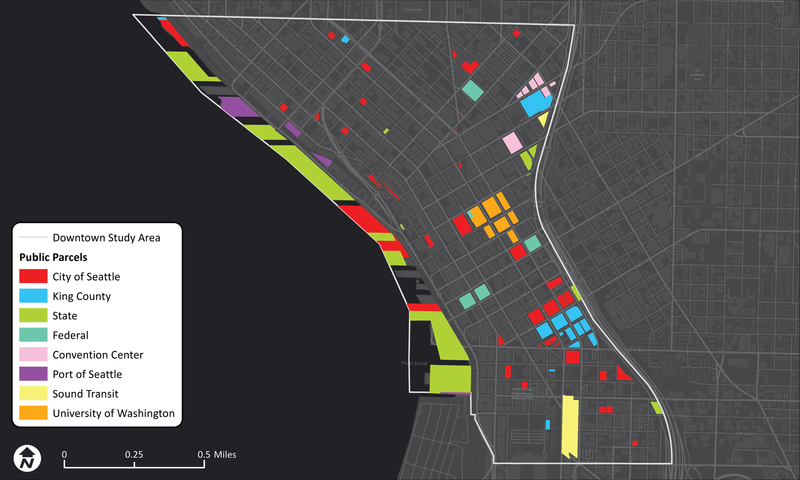 This is a fairly substantial figure but it is simple to visualize: six to nine city blocks (depending on the block size) or about the area of Cal Anderson Park. Importantly, less land is needed if multiple uses can be combined on single sites. This is discussed after the next step of examining public land supply. This section sifts through the current inventory of public land and follows with acquisition contingencies. The analysis is more refined than an approach recently taken by the King County Assessor’s office, which published an indecipherable map of all government-owned parcels within Seattle city limits. Examining the situation on the ground furnishes a clearer picture. The primary interest is action that can be taken by the City of Seattle, so this step only identifies City-owned properties. There are a number of them developed in Downtown. The larger sites include the administrative and public safety campus, Benaroya Hall, the Central Library, and the waterfront aquarium and piers. Smaller properties include parks and SHA apartment buildings. 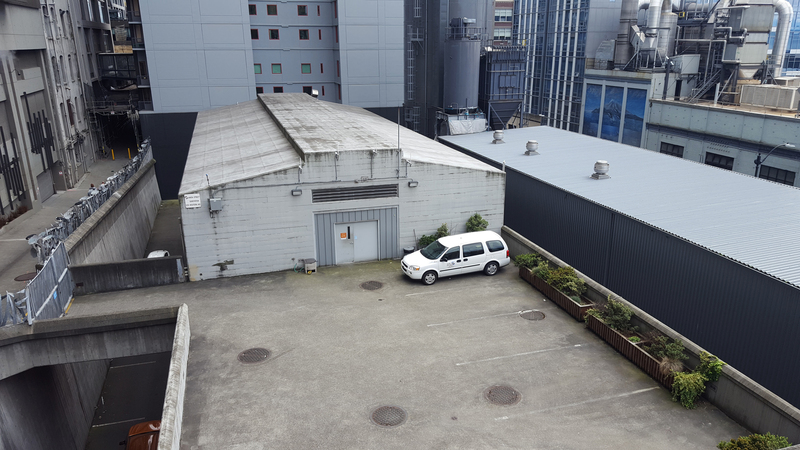 A 0.2 acre Seattle City Light parking lot in Belltown could be used for a small capital facility. However, it may already be planned to become part of a new park when the adjacent Alaskan Way Viaduct is demolished. This list doesn’t come close to satisfying the projected land need, so the search must be broadened to the full range of public agencies. Many other governments own land in Downtown. Among them are King County, the state government, the federal government, the Port of Seattle, and the University of Washington. 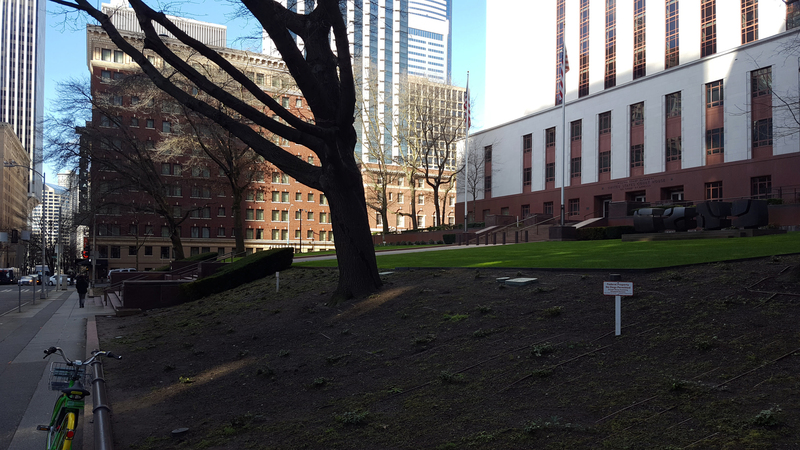 In front of the Nakamura Federal Courthouse is 0.6 acres of park-like open space that is almost virtually unused, directly across the street from the Central Library. Working within the security constraints of a federal facility, this site could be formalized and programmed as a central park that is more welcoming, usable, and accessible. 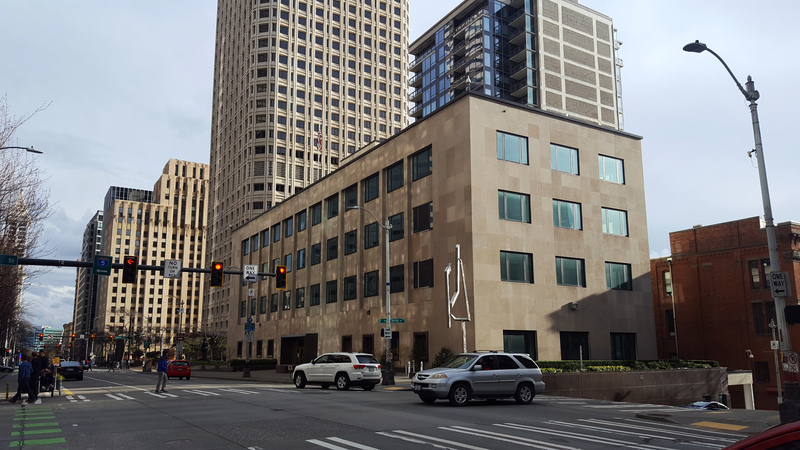 A wooded 0.6 acre King County site at 6th and Yesler sits between a private office building and I-5. It’s possible the site is being landbanked for future King County office space, an objective that is not necessarily exclusive of other public purposes. A moderate slope and proximity to loud, polluting freeway traffic would require design mitigation. Between King Street Station and the Weller Street pedestrian bridge is a 0.2 acre parcel owned by the King County Wastewater Division. It has sat empty and fenced off for years. The federal post office at 3rd and Union sits on about 0.7 acres. Though not historically landmarked, it is a sturdy 1959 concrete building and the airspace above it might be utilized like how the old Federal Reserve building is being expanded. Other government-owned sites that appear viable today already have private development plans: the four acre Metro bus layover station owned in the Denny Triangle, and the University of Washington’s 1.4 acre Rainier Square site in the commercial core. The sites listed above are important candidates, but their cumulative area is about four acres, much less than the dozen acres needed. The analysis now turns to opportunities for acquiring private real estate and bolstering the portfolio. Following is a three-part analysis of increasingly challenging alternatives. As essentially blank slate sites with limited demolition required, these parcels are the most straightforward to purchase and develop. Surface lots are becoming rare as demand for office space and new homes create development pressures, but a number remain. Smaller lots are likely to survive longer because they are less efficient to develop, though that is balanced against their lower land value. 1975 commentary on urban development by The New Yorker. The larger sites could be best utilized for programs with intensive footprints like schools, community centers, and moderately-sized parks. Smaller sites would be ideal for pocket parks and mid-rise public housing (perhaps with a library or community space on the ground floor) and would have the benefit of filling in the urban fabric. Though larger sites would be most straightforward to develop, acquiring and utilizing many smaller sites could distribute public resources throughout the neighborhoods. Private interests are almost certainly biding their time to develop these parcels. The below map shows 10 acres of parking lots that have either been redeveloped in the past few years or soon will be. 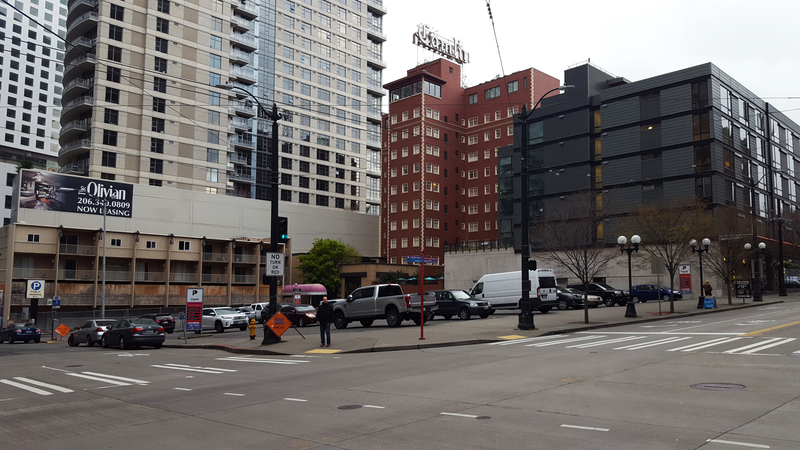 For example, large surface lots which exist today will soon be replaced by a 48-story apartment tower at 3rd and Virginia, a 54-story residential building at 5th and Stewart, and a 55-story apartment and hotel tower at 8th and Pine. The pattern is focused on upper Belltown and Denny Triangle but it is likely to spread to the rest of Downtown as the land supply dwindles. The next easiest strategy for land acquisition is above-ground parking garages. Many are approaching or beyond the end of the typical 50-year lifespan and have endured decades of heavy wear and tear. Further, underground parking is now the norm, allowing cars to be tucked away out of sight and freeing the airspace above for people to live and work. These factors along with high-rise zoning, evolving transportation preferences, and an impending wave of autonomous vehicles makes above-ground garages tempting candidates to tear down for higher and better uses. Replacing unsightly and polluting parking with public uses, especially housing, is also a powerfully efficient way to meet the city’s goals for reduced carbon emissions. 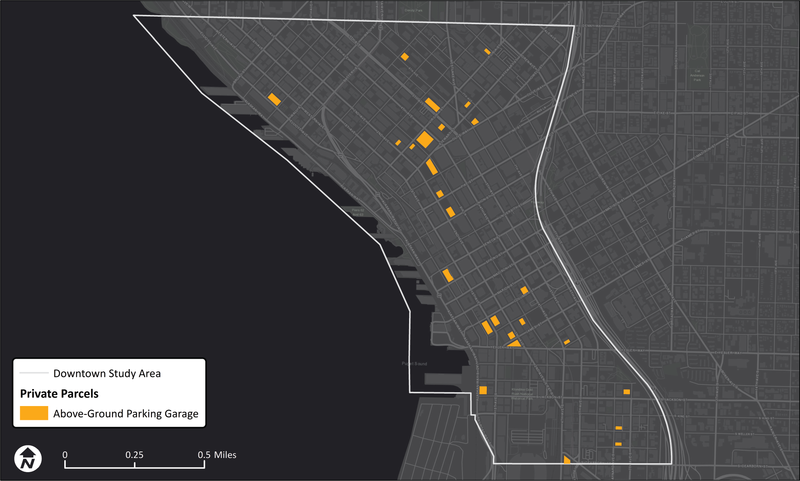 Puget Sound Regional Council parking data demonstrates many Downtown garages are not well utilized. Among surveyed facilities, in 2013 the average occupancy for the central business district was 65 percent. Since 2010 Downtown has added 45,000 jobs without adding nearly as many cars, indicating a shift towards transit, walking, bicycling, and taxi services. The map below illustrates where these structures are located. 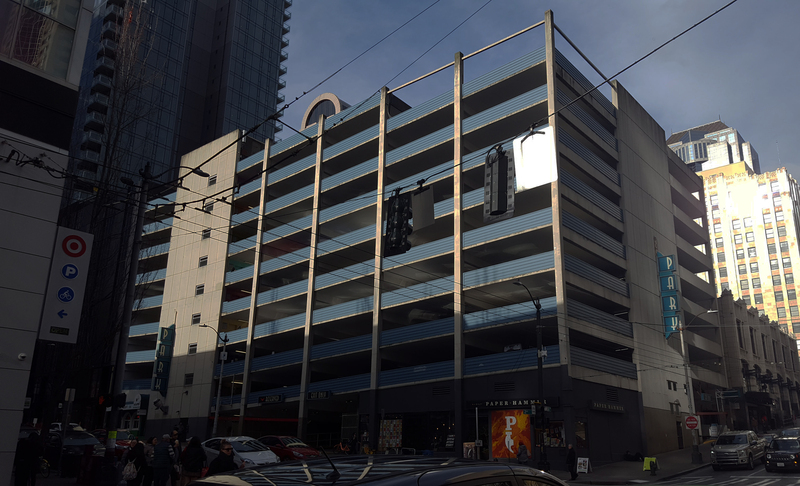 This inventory excludes most above-ground garages with other uses above (such as the 520 Pike Street building) and those integrally attached to the principle building (such as at the Warwick Hotel). The map also excludes garages that are already planned for demolition, such as two garages that will make way for 4/C, potentially Seattle’s next tallest tower at 100 stories. The Securities Building has a complex of structured garages above retail stores at 3rd and Virginia. The combined facility sits on 1.3 acres, opened in 1960, and has 520 parking spaces. 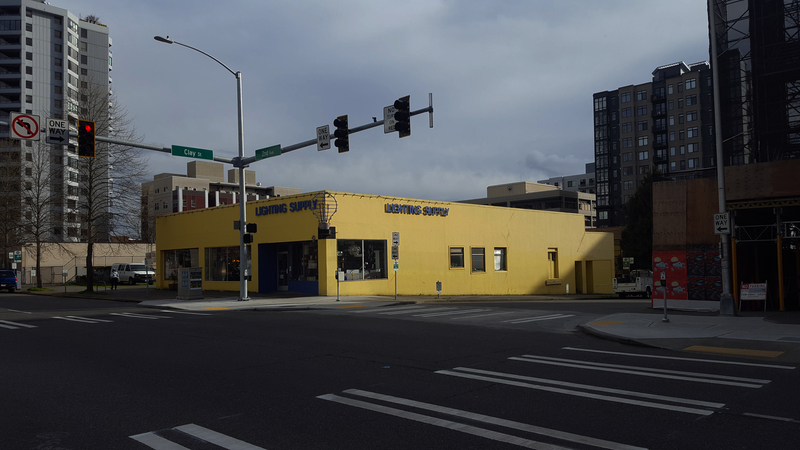 The Swiftsure Garage sits on 0.5 acres at 2nd and Union and opened in 1969. It is nine floors with 509 parking spaces. A block away the West Edge Garage is on a 0.3 acre at 2nd and Pike. It opened in 1963. It is seven floors with 335 parking spaces. The CPS Garage at 1st and Columbia was built in 1970. It sits on a 0.6 acre site and has nine floors with 509 parking spaces. The Elliot Parking Garage on Western and Vine opened in 1979 on 0.7 acres with five floors and 593 spaces. 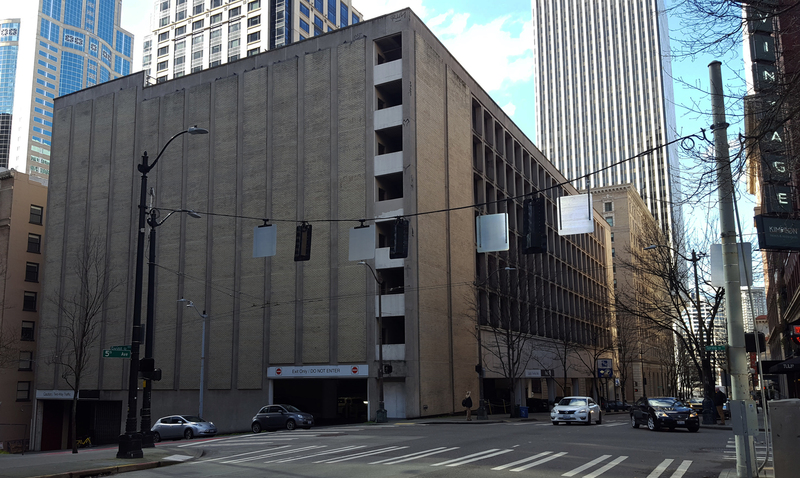 The Denny Building Parking Garage at Bell and 6th opened in 1968. It has 244 spaces on five floors and a 0.3 acre site. The Cherry Street Parking Garage at 3rd and Cherry was built in 1900. It is on a 0.2 acre site with five floors and 210 parking spaces. The Olympic Garage is on a 0.6 acre site at 5th and Spring and opened in 1964. It is nine floors with 640 parking spaces and a small retail store. With its large site and central location it could be a prime opportunity for a mixed-use school and housing development in partnership between the UW, the City, and Seattle Public Schools, an idea explored in a 2014 design studio. The Washington Garage at 3rd and University. It sits on a 0.3 acre site, opened in 1966, and has seven stories with 316 parking spaces. This option would be the last resort because it is the most difficult, expensive, and controversial. Unlike the steps above, here a deep dive is postponed due to the wide range of technical and political factors. If the public properties and private parking sites turn out to be nonviable then a more thorough analysis will take place. 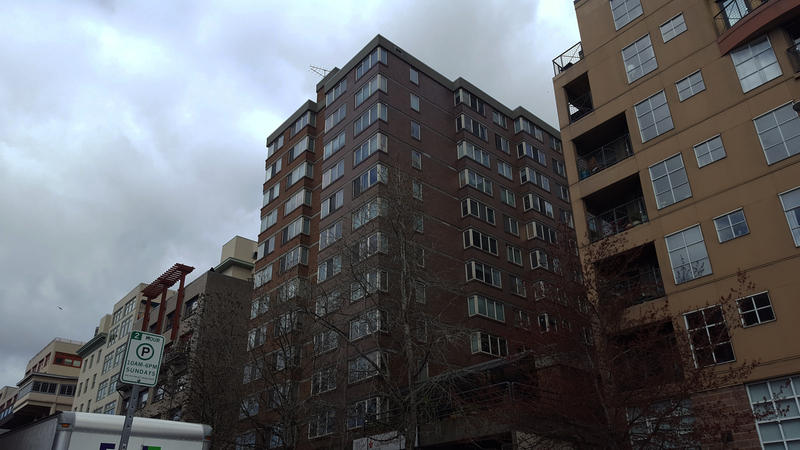 The three-story Fassio office building in Denny Triangle will be torn down for 44- and 16-story residential buildings. Not all short buildings are inevitably destined for demolition. Historical landmarks on prime land, like the Ross store and the Mann Building at on 3rd Avenue, and culturally significant structures are likely to remain indefinitely. Such buildings contribute to the city’s variety of architectural charm, support small commercial tenants, and oftentimes provide affordable houseing. Where development pressures do touch small historical properties in Downtown the result is often expansion and renovation, not a tear-down. For example, the four-story Federal Reserve building will have an eight-story addition built above it in a zone with no height limit. The five-story Maritime Building on the waterfront is gaining an extra three floors in a 170-feet zone. The First United Methodist Church at 5th and Marion could have made way for more office space at F5 Tower but was beautifully restored as an event space. Above five stories buildings are (relatively) permanent and the underlying land is unlikely to ever be available for public acquisition. 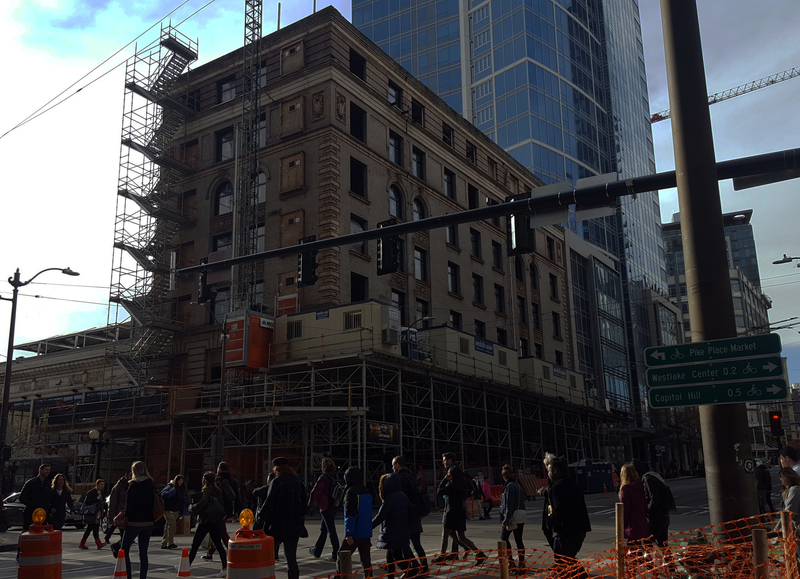 For example, the 113-year-old State Hotel at 2nd and Pike sat derelict for decades. It could have easily been torn down to make way for a mid-rise tower., but today the seven-story building, in a zone that allows 240 to 440 feet of height, is being gutted and fully upgraded. With proper maintenance and barring catastrophe cities can expect taller concrete and steel buildings to last centuries. Downtown towers going up today will almost certainly grace Seattle’s skyline forever, as demolition for economic or functional reasons is extremely rare. When skyscraper demolition does occur a public agency is unlikely to have a chance to make an offer because the property owner intends to retain ownership and rebuild on the site. That’s been the case at 270 Park Avenue in New York, a 52-story modernist office tower that JPMorgan Chase will demolish in 2019 and replace with a 70-story building for more employee capacity. In a unique quirk of Seattle history, the 25-story McGuire Apartments in Belltown only lasted nine years before being demolished due to major structural deterioration and threat to life safety. Wasting little time, another 24-story apartment building is now under construction at that site. In summary, there are about four acres of public land that can be put to better use and many more private sites that could be acquired. With so many parking lots and aging parking garages ripe for demolition, the City should move quickly to further analyze the best sites and negotiate with the property owners for purchase. These options will not last forever, but in theory this combination can meet the demand outlined above. In practice, the City government is unlikely to have an appetite for purchasing new property. In fact the City is actively shedding its inventory as quickly as it can. 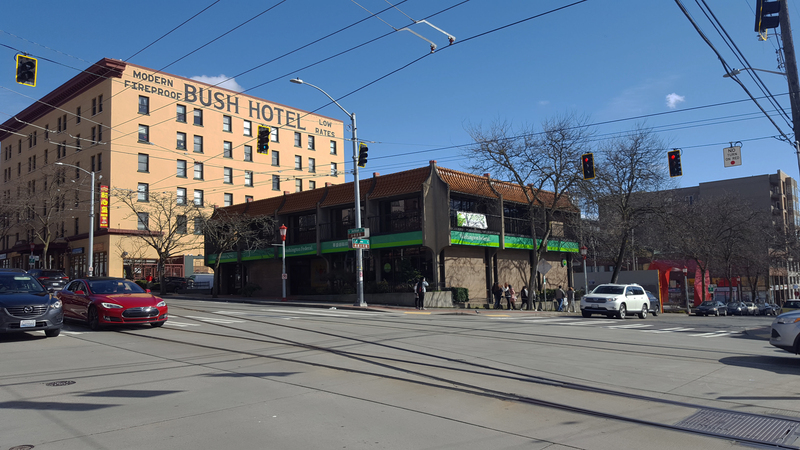 Public sites that would otherwise be available for meeting crucial community needs are being sold off to private interests, including the full block next to City Hall and a police communications shop in Denny Triangle. This month the City Council declined to hold on to the Battery Street Tunnel for three acres of adaptive reuse. Further afield a South Lake Union megablock created from the Mercer Street construction is likely to be sold without any public uses on the site, and under community pressure the City only reluctantly backtracked on selling 29 acres of land in the Duwamish Valley. Seven substation sites in northwest Seattle are currently for sale. The Real Estate Services website provides a list of other recently sold properties. Acquiring land is one of the biggest hurdles affordable housing providers must negotiate. Typically non-profit builders seek city subsides to finance their projects after they’ve secured a site, which is an increasingly competitive bidding process as the real estate boom continues and prime sites get rarer. Better leveraging land the public already owns offers a way out of this conundrum. In some cases, perhaps public land can be leased rather than sold to keep the valuable sites in public hands. Additionally, to exert more control and pick up the pace of affordable development, Seattle could take a direct role in building public housing rather than relying so heavily on non-profit developers. Councilmember Mosqueda indicated she’s open to the idea of Seattle Office of Housing directly building public housing again. As a community we should put short-term thinking behind us and move towards a more resilient utilization and acquisition strategy for public land. Seattle should invest in real estate, especially Downtown, to help support a more prosperous and healthy future for the entire city. In just one example a large enough site could support a mixed-use tower with a school or community center on the bottom floors and public housing affordable to teachers and baristas above. Some floors could even be leased office space (taking a cue from the UW), providing a revenue stream to support housing and capital facility improvements in neighborhoods in all corners of Seattle. The City must also be creative with mixed-use infrastructure. The large Denny Substation in South Lake Union might have been better located underground with housing above. Similarly, Fire Station 10 in Pioneer Square, covering a full city block only steps from City Hall, could potentially have a tower built above it with housing and other uses; if that proves infeasible today, fire stations typically last 40-50 years (the facility opened 2008). Over the long term the City can build multiple uses at fire stations, libraries, community centers, transit hubs, and other public facilities citywide. 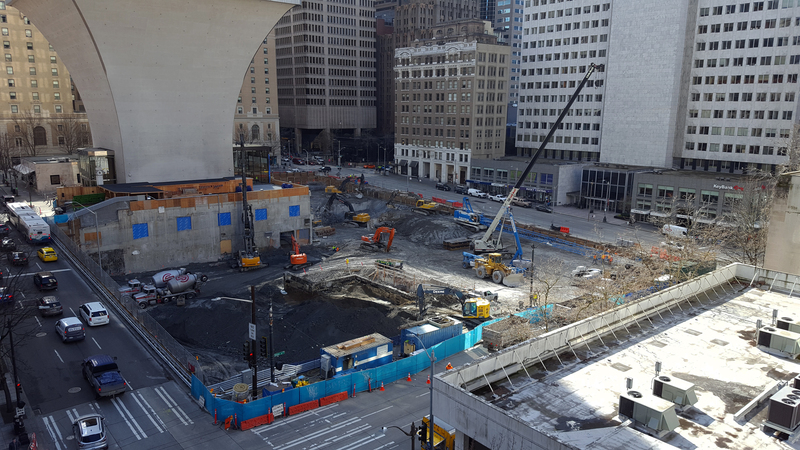 It’s conceivable that within 10-20 years the Downtown Seattle skyline will be “finished” as private construction develops the few remaining available sites. However, with continuing growth there remains a number of absent public infrastructure services in the city’s core, including affordable housing, schools, community centers, and public open space. The urgent need for leadership and action is reinforced with every private groundbreaking. Unless steps are taken to purchase private parcels or ink ground lease deals with landowners, the opportunities to provide these critical land uses in our urban core will quickly slip by. Investing in land today will help build a more sustainable, resilient, affordable, and healthy Seattle tomorrow. This entry was posted in Housing, Land Use, Policy, Public Space, Schools and tagged acquisition, affordable, agencies, analysis, Belltown, calculation, Chinatown, civic, Commercial Core, community center, demand, denny triangle, downtown, fire station, governments, growth, historic, housing, infrastructure, International District, land, landmark, library, parks, Pioneer Square, plan, Planning, public, public space, residents, Seattle, supply, utility. Bookmark the permalink.